"Dry Season is a body of works so translucent the colours flow over each other as the light plays on the country and the memory of country is revealed... we are journeying through the landscape with Angelina George and reflecting with her on the beauty and grandness of the country, She surprises the viewer with her vision and reminds us of the secrets, mystery and intensity of the land- the inspiration of her work. Angelina's technical confidence as a painter shimmers across these canvases.... a palette of light dry season colour against, rough scratches of deep reds and brown. The paintings are at the same time both textured and smooth, each work an immersion in the landscape captured on the canvas." 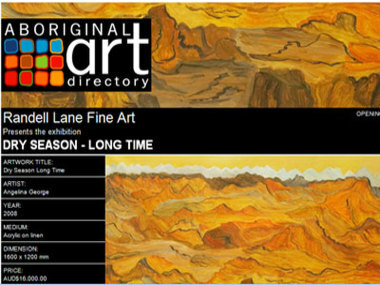 View Randell Lane Fine Art Gallery presents Dry Season - Long Time, Perth Australia eBlast.